It's a basic thali with home-cooked food in South Indian style with unlimited servings. What stole my heart in addition to food was the service, as the servers had a constant smile on their food and served with love. The food was absolutely delicious with simple vegetables tasting so different, the texture of the curd par excellence, sambhar, rasam and sweet dishes like seasonal aam ras, shrikhand and rasgulla to choose from. Some background for first-time eaters on how, what and why will increase the familiarity. Take the train to Matunga station as it is right outside. Lanes too crowded to take a car there Be patient and prepared for your turn on a busy day, it is worth the wait. 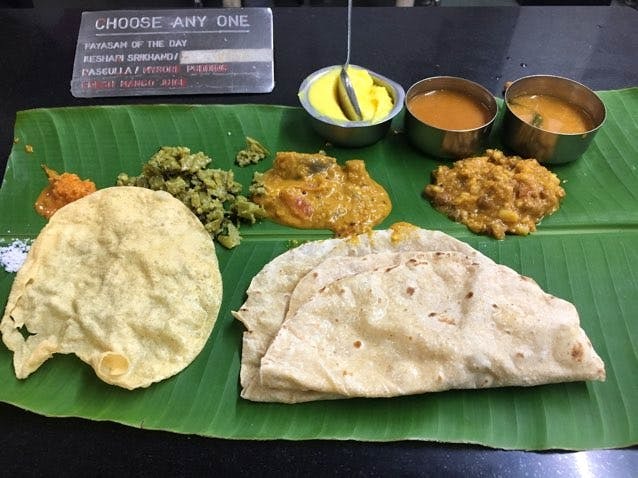 And last but the least, indulge in the food with your hand to get the real South Indian experience.